Prime Minister Narendra Modi has said India's own ecosystem of startup is evolving rapidly which is driven by energy, enterprise and innovation of youth. India now has the institutions, incentives and interest for new ventures, Modi said on Sunday at an event organised by National Association of Software and Services Companies, also attended by LinkedIn co-founder Reid Hoffman. "India's own ecosystem of startups is evolving rapidly. “It is driven by the energy, enterprise and innovation of our youth. We have a huge market with rapid growth and untapped opportunities in every sector," Modi said at the startup event in Silicon Valley. 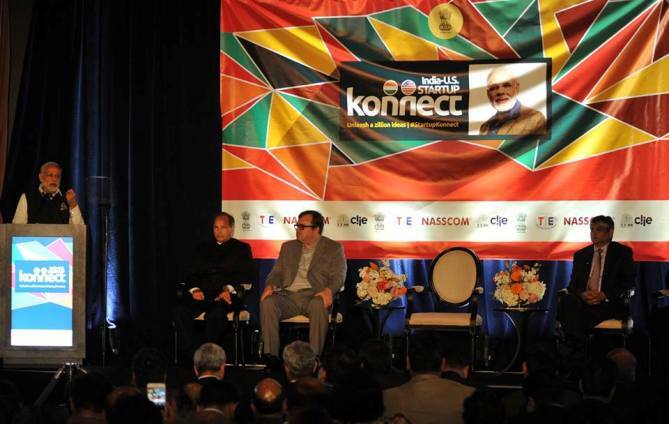 He said it is natural for India to hold its first overseas start up event in the Silicon Valley. India and the US have a natural partnership of innovation and technology that has shaped the knowledge economy. "We have incubators, accelerators and investors willing to back an idea and assume risks. India has woken up to the potential of Startup Ventures with great enthusiasm and energy. “In the past few years, they have grown exponentially," Modi said, while expressing confidence that it would start a new revolution of employment, entrepreneurship and growth in India. Before the event, 40 startups each from India and the US had a India-US Konnect 2015 event organised in collaboration with TiE Silicon Valley and Indian Institute of Management Ahmedabad's CIIE India. "We have here an outstanding group of Startups from India. They are applying technology to transform healthcare, education, agriculture, clean energy, security, financial inclusion of the poor and access to clean water," Modi said. "Our Startups represent not just commercial success stories, but are powerful examples of social innovation," he said, adding that pace at which people in India are taking to digital technology defies stereotypes of age, education, language and income. There are nearly a billion people with cell phones in India; smart phones and Internet users are in hundred millions, growing at high double digits, Modi said. "This is the vision and the spirit behind Digital India, to use technology to transform governance, empower our citizens, eliminate barriers to opportunities, deepen social change, impart scale and speed to development, improve delivery of services, design affordable products for the poor, customise services for specific groups, and build a more sustainable future for our planet," he said.